Jumeirah at Etihad Towers opened its doors to the world on Tuesday (1st November) with its very first guest checking into the property. The luxury hotel located on the Arabian Gulf in the Ras Al Akhdar area of Abu Dhabi, which is close to the central business district and ministry compounds, is the first Jumeirah property to open in the UAE’s capital. 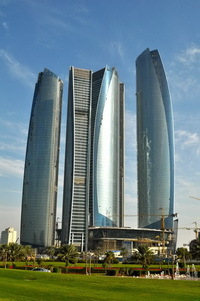 Consisting of 382 guestrooms and suites, 199 fully-serviced residences, 12 restaurants, bars and lounges, Talise Spa and one of the largest conference centres in Abu Dhabi, Jumeirah at Etihad Towers stands 280 metres tall and is furnished throughout in a modern contemporary design using rich materials including highly prized Italian marble, custom-designed hand-tufted carpets and photographic art works depicting life in Abu Dhabi during the 1960s from the private photographic collection of His Highness Sheikh Suroor bin Mohammed Al Nahyan.